Preventative dental care is an important part of maintaining a healthy and beautiful smile. Our Newport Beach registered dental hygienists help to improve your oral hygiene, prevent gum disease, and increase the longevity of your teeth. A regular preventative dental care appointment schedule with our Newport Beach hygienists is essential for maintaining your healthy smile. Although less devastating, other uncomfortable effects like bad breath and stained teeth may affect your self-esteem, social life and career, lowering the quality of your life. Keeping up with daily oral hygiene by brushing and flossing at home is very important. However, doing this does not protect your teeth from developing dental plaque or tartar, a hard build-up that can be a serious threat to your oral health and overall wellness. That’s why receiving regular dental hygiene treatments is important to ensure that your teeth and gums are maintained in their optimal condition. A healthy smile is not just a matter of aesthetics, but a serious prerequisite of a wholesome life. The actual dental cleaning procedure is gentle and painless. Your teeth will be treated with special equipment that loosens and removes any bacterial plaque, tartar or stains. If necessary, after the cleaning procedure your teeth might be treated with special medications. Usually standard cleaning will take 1 hour and will leave you with a pleasant feeling of freshness. You might also notice that your teeth look whiter. The professional dental cleaning is indispensable because it reduces the amount of harmful bacteria that not only cause bad breath but could also infiltrate your blood flow threatening your overall health, if left untreated. 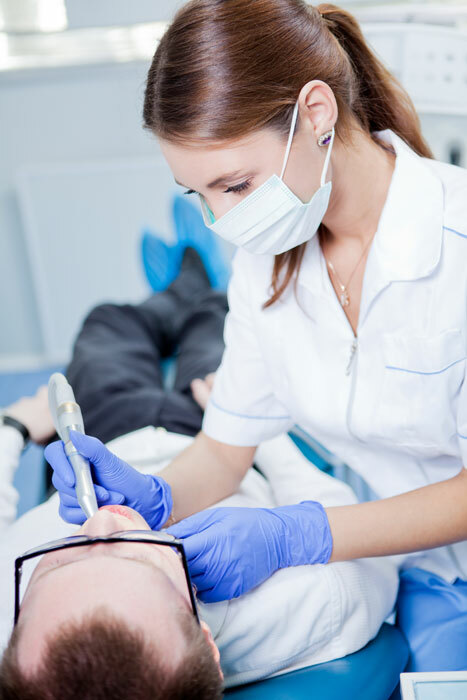 The cost of dental hygiene treatments varies depending on the extent of the required work and is often fully or partially covered by dental insurance. A standard teeth cleaning is the least expensive treatment option that is suitable for well-maintained teeth and is considered preventative care. Deep cleaning necessary to remove substantial buildup is more expensive and requires several visits to complete. If you would like to discuss the details and insurance coverage for your dental treatment, request an appointment at Dr. Desiree Yazdan?s office in Newport Beach. If you have any questions or would like to schedule your dental appointment, do not hesitate to contact our restorative and cosmetic dentistry offices in Newport Beach, CA, today and experience the numerous benefits of our excellent dental services!